Kirby Building Systems, a global leader in pre-engineered steel building (PEB) systems, plans to make significant efforts to expand its presence in the vast African market following its success in the Middle East. Kirby has in all five plants including the two in the Gulf in Kuwait and Ras Al Khaimah (UAE), two in Hyderabad and Haridwar (in India) and one in Vietnam, contributing to total annual capacity of 425,000 tonnes. Turki said Saudi Arabia accounted for a majority of Kirby’s sales in the Middle East and Africa region, followed by the UAE and Kuwait. Kuwait contributed a fifth of total sales; projects completed in the state in 2014 included warehousing PEB projects for companies including Agility and KGL as well as buildings for oil and gas industry customers such as Kuwait National Petroleum Company and Kuwait Oil Company. 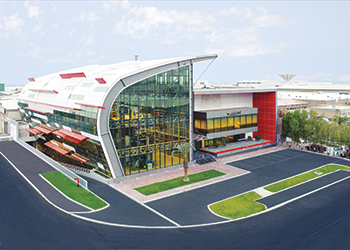 Elsewhere in the region, some of the major projects completed by Kirby last year included Brazilian Food Factory and Ikea Regional Distribution Centre (both in the UAE), Lulu Hypermarket and Qafco Warehouse (both in Qatar), the National Theatre and Al Bilad Warehouse (both in Bahrain) and Al Nariyah Workshop for work related to the North-South Railway (Saudi Arabia). The Ikea facility, area 98,000 sq m, and the Al Nariyah Workshop, 39,000 sq m, were the largest in area. 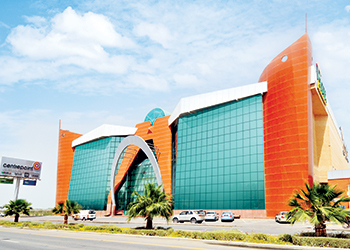 The Agility warehouses had an area of 25,000 sq m, the Al Bilad Warehouse 22,800 sq m, the Brazilian Food Factory 21,000 sq m, the Lulu Hypermarket 13,250 sq m, the National Theatre 11,869 sq m and the Qafco Warehouse 5,207 sq m.
“The business outlook is good. While oil prices have been down, we’ve hardly noticed any effect on the GCC’s main markets. 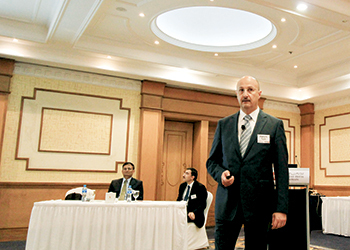 Growth is occurring in all sectors – commercial, industrial and logistics in the GCC countries,” Turki said. “We wish to capitalise on our three major markets of Saudi Arabia, the UAE and Kuwait where we see further potential. Now our Gulf focus is enforcing our Qatar presence where we’re investing in sales operations. Just yesterday we held our business seminar there,” remarked Turki on the sidelines of a similar business seminar in Bahrain. The official said Kirby’s R&D (research and development) department is constantly working at improving existing offerings and introducing innovations for a market that has become increasingly competitive and demanding.